With the nights drawing in we look forward to the new challenges the next year will be setting, maybe we’ll take some inspiration from November’s guests. Karen Kelly (Past Chairman) and Ann Scovell (Past Secretary) are part of the Pink Champagne Breast Cancer Dragon Boat Team and, as you will read below, this a group of people who have used an activity to not only raise awareness but proved that it can make a positive change to those affected by breast cancer. For once it is OK to stick your oar in! This month is our 29th Anniversary Luncheon. The reception and luncheon will again be in the “Lake Suite” on Friday, November 16th and you can reserve your places here. December is our Christmas Fun Luncheon. Our guest speaker is a comedian Keith O’Keefe who is one of the funniest one liner comedians in the south. The Christmas luncheon is an opportunity to bring along the office staff, or partners, or your favourite business guests. All in all a real deal at £45.00 a head. 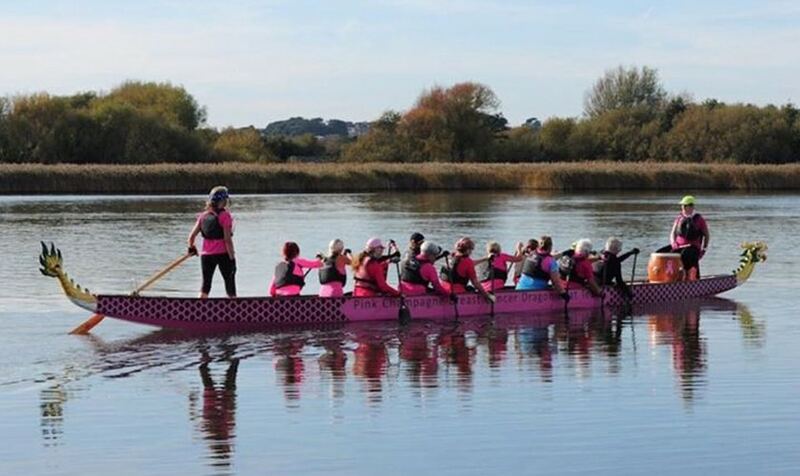 The Pink Champagne Breast Cancer Dragon Boat Team was established in 2008 by a group of breast cancer survivors, along with help from the Royal Bournemouth Hospital and a team of exercise therapists. They join other teams worldwide to act as role models, to inspire and encourage other breast cancer survivors to achieve the physical, psychological and social benefits of this activity. In 2014, NICE (Clinical Excellence) updated their guidelines to endorse regular, repetitive strenuous exercise for Breast Cancer survivors – and it went on to cite Dragon Boat Racing as a good example! 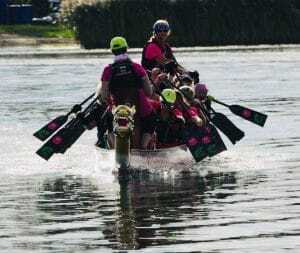 There is now an International Breast Cancer Paddlers’ Commission (IBCPC) and teams compete against each other worldwide. Pink Champagne attended the International 4-yearly Festival in July this year where almost 192 International teams competed and every continent was represented. As a Charity they aim to raise awareness of breast cancer and to encourage those who have been diagnosed and treated to continue with full and active lives; to provide support and fellowship; to demonstrate the benefits of our sport and to actively celebrate Life! This entry was posted in News on November 1, 2018 by Xan Phillips.